This Carpet Moth Killer Kit enables you to carry out a comprehensive carpet moth treatment to one room. The combination of insecticides in the Kit delivers a rapid knockdown of carpet moth and helps maintain long-lasting carpet moth control. 1 x Pest Expert Formula 'C+' Carpet Moth Spray 1L: For application to carpets, rugs, soft furnishings or anywhere in the home or workplace for effective control of carpet moth. Covers 20 sq m.
1 x Pest Expert Formula ‘P’ Carpet Moth Powder: For application to carpeted areas, cracks, crevices and in areas where electrical equipment may be present and a water based spray cannot be administered. 1 x Pest Expert Formula 'P' Carpet Moth Fogger: A powerful one-shot aerosol for fumigating carpet moth infestations. 1 x Demi Diamond Moth Trap and Holder: Slow release pheromone trap for aiding early detection, monitoring activity following treatment and disrupting the moth breeding cycle. A pheromone pad lasts 8-12 week. The Kit is also supplied with step-by-step instructions to explain how to carry out a complete professional-standard carpet moth treatment using the carpet moth products provided. Full instructions are included with the Carpet Moth Treatment Kit Standard. Used in three places, Kitchen, Study, Living room. Most effective and has been completely fit for purpose. Worked. Really pleased with the results and took care of our infestation. As advertised. Fast efficient service. Just what we needed. Great products would definitely recommend it to any one looking to get rid of a small infestation fast and quick. Worked a treat! got rid of all the moths in the room with the problem. Great bit of kit cleared the moth problem and save me a lot of money thanks pest control supplies. A good combination of treatments hopefully having a longer term effect! Do the job. Give me peace of mind. They're doing their job. Don't think I'll ever live without them now. Tres bon. Good kit. The spray had a good amount in there and the smoke bomb worked very well. Good. Has effect for the first 3 weeks of the treatment. So good so far. Not completely finished treating yet, but haven't seen any adults for a while, so this seems to work. Quick to arrive and easy to use. Just hope all the annoying critters in the hen houses have gone! Excellent kit. Still working on it but it definitely shows the results! WOW is all I can say! Bought this kit and it was delivered in under 24 hours AND got rid of the pesky carpet moths! 5 out of 5!!! Excellent, great value kit that actually works! Already recommended you to my friends! Good products and even better that they have an advice line with friendly and helpful staff to help with queries prior to ordering. Was so worried when I found out I had carpet moths in my wool carpet. I came across Pest Control Supplies and their kit worked a treat! Came with full instructions, a mask and a pair of gloves too which was really useful. Thank you for such an excellent product, it completely got rid of my infestation!! I was absolutely devastated when I found moths in my favourite woolen carpet. 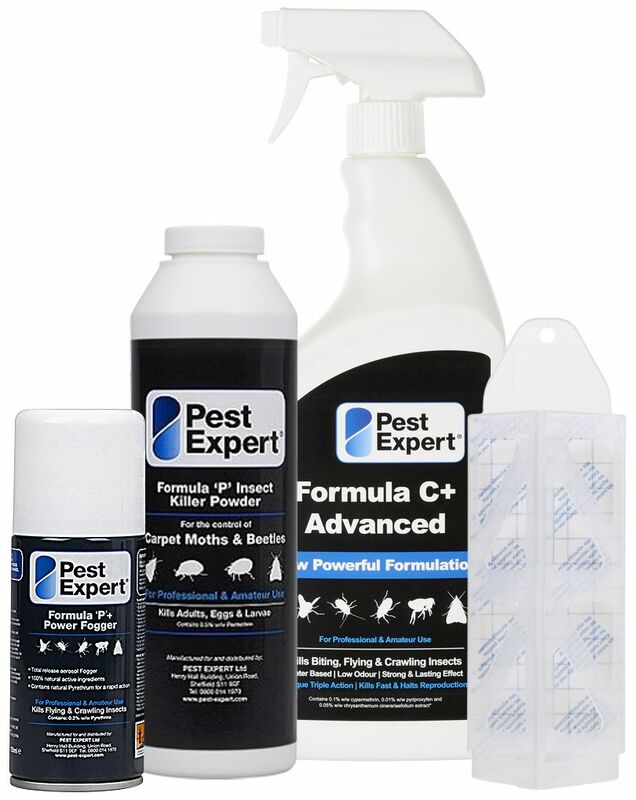 Pest Control Supplies saved the day with this fantastic kit. It has absolutely everything you need to get rid of the little blighters because it got rid of mine! Thanks a million!!! Great products with super fast delivery, can't fault it! Fab stuff got rid of the moths after one use! Wouldn't hesitate to use you again should I need to! Thank you for such an excellent product! I'm always sceptical about products like this but they actually work! Goodbye carpet moths!! Fast delivery and products that work a treat ! What more could you ask for!? Thank you for an excellent product to get rid of the carpet moths I had. Killed the carpet moths after one fumigation - excellent stuff thank you! Good products that kill straight away, what more can you ask for. 5 stars for you pest control supplies!!! Thank you for such a good product, it killed the carpet moths! Was terrified when I found I had carpet moths... glad I found this company their products killed them! Got rid of my infestation thank you so much guys !! Fast delivery and simple, easy to use products that come complete with instructions. Thanks for a swift service and even better products. Have already recommended you to others! Killed all of the carpet moths that had infested my carpet! High quality products and a quick delivery service. 5 stars! Thank you so much for such excellent products ! Got rid of my carpet moths, what more could you ask for?